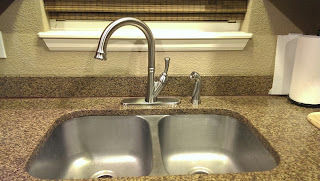 Tiny Scraps: The Kitchen Sink and Beyond! Our list of "Things I Want to Improve About My Home" just keeps getting bigger and bigger as we complete more projects. Truth be told, I like working on the house though. If we ever did complete everything we wanted to do, what would we do then? Sit around and bask in the glory, I suppose, but I'm sure that would get boring eventually. Some small improvements we made right away when moving in. These things were simple to do, even for us DIY newbies, and each improvement increased the value of the house, which is really what we wanted to do right away. Buying a home is an investment. Will this be our one and only home for the rest of our lives? Probably not. So, whatever we can do to increase the home value now will result in a bigger down payment on our next home. We started with the kitchen sink. The granite counter top in our kitchen is beautiful; it was one of the selling points for me. 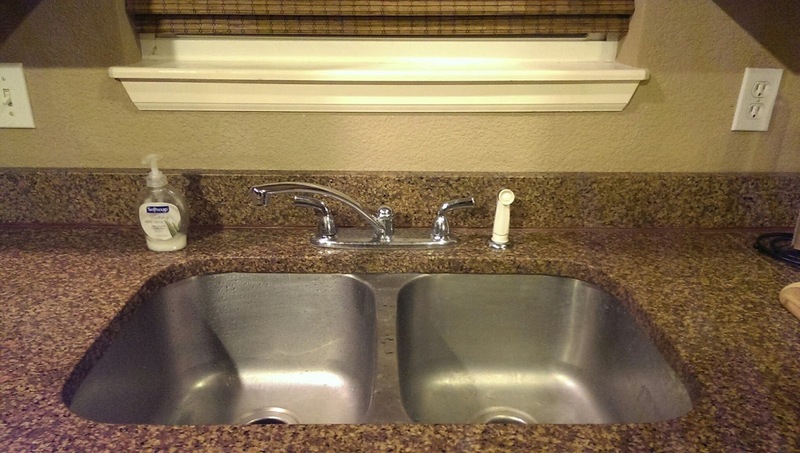 The sink is really deep too, and I like deep sinks because I don't like doing dishes, but the faucet was so blah. There was really nothing wrong with it apart from the sprayer not matching, which annoyed me. I think our reasoning for changing it was 40% because a new faucet would make the kitchen look so much nicer, and 60% because we don't have a water dispenser on our fridge, and a higher faucet makes filling the water purifier so much easier! Priorities. That old thing just had to go! After - Ooh La La! Ooooh I looks so much better after!